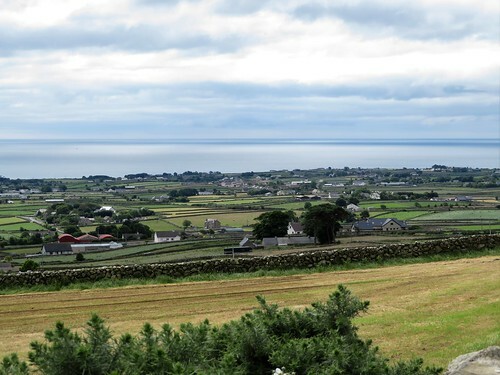 A cool, blowy morning on the coast of County Down, with the clouds rolling back off the Mourne Mountains and skylarks beginning to sing out their claims to territory in the stony fields at the feet of Slieve Binnian. 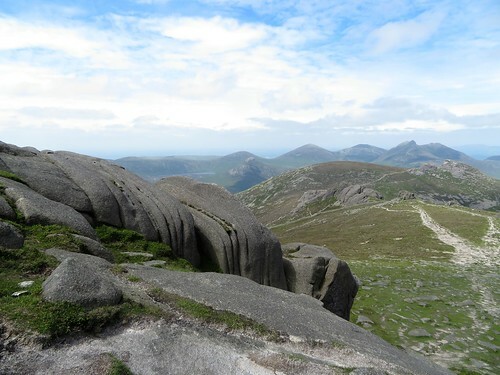 From an ancient droving route in the Annalong Valley, bounded by walls of giant granite stones, we looked up to see Binnian’s rocky head outlined against a dark sky. 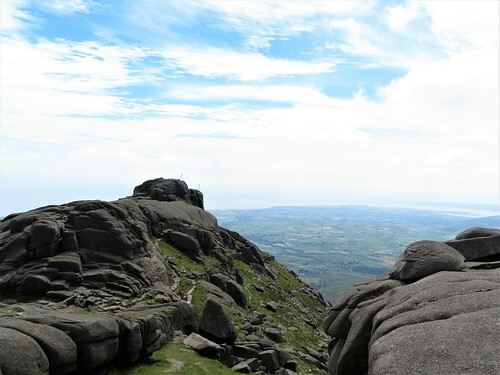 The old track forged north to its crossing place through the granite barrier of the Mourne Wall. 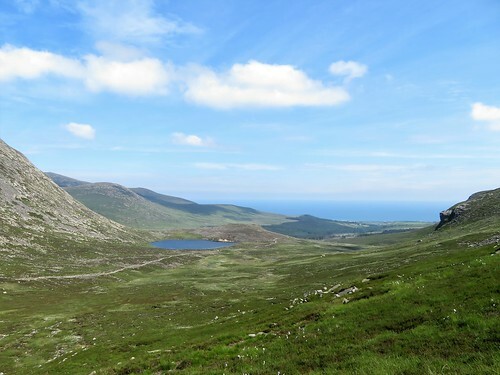 The local men who built this great 22-mile ring early last century around the catchment area of the Mourne reservoirs certainly knew their business. 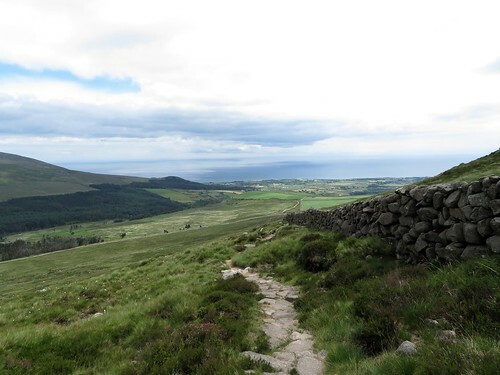 The Mourne Wall hurdles the highest mountain tops as though they are of no account. Today it made a fine trustworthy companion as we turned west and followed it up the mountainside. 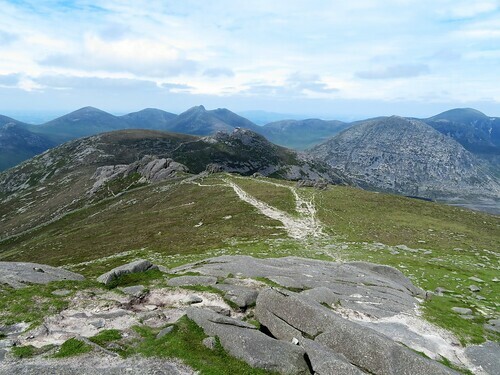 The climb soon steepened, and there were plenty of pauses to look back around the bowl of hills that centres on rocky-faced Slievelamagan and the tall cone of Slieve Donard, daddy of the Mourne range at 853m. 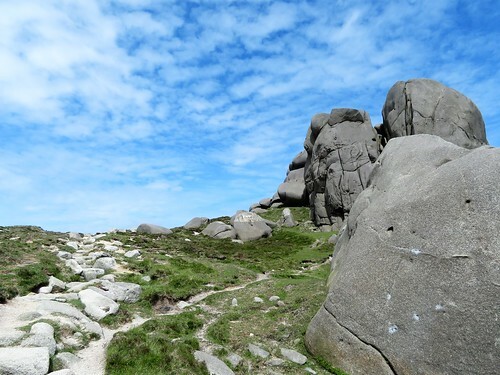 Up ahead a line of granite tors crowned Slieve Binnian’s ridge, black and jagged like the turrets of a bad man’s castle. ‘Bit windy up there,’ grinned a pair of girls leaping lightly down the rocks. 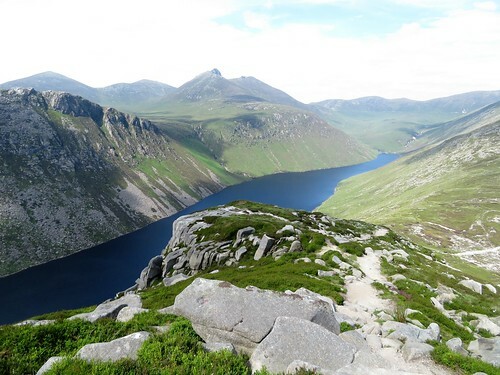 They were right about that, but the view that burst on us from the top was worth climbing the tors for – the long steel-blue triangle of Silent Valley reservoir two thousand feet below, the coires* of Slieve Muck beyond, and in the distance the hills of the Cooley Peninsula and the broad spread of Dublin Bay towards the distant Wicklow Mountains. 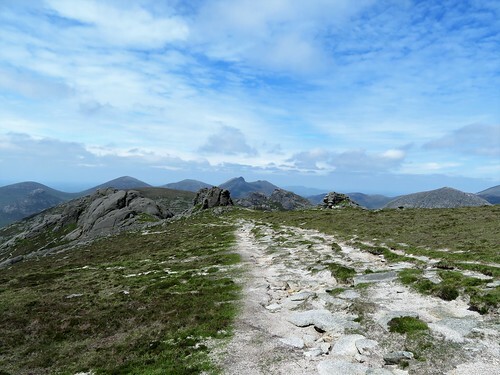 A path of skiddy granite rubble led us north past the Back Castles, wind-smoothed tors of elephantine grey, to drop steeply down to a saddle of ground under Slievelamagan. 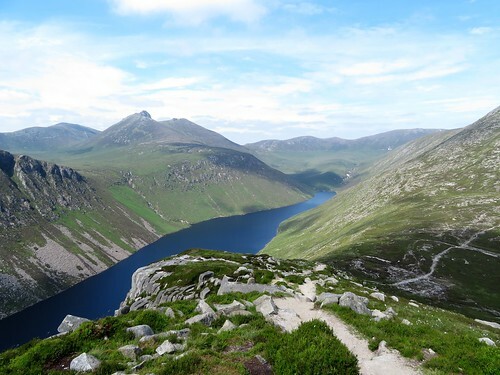 A last look across Ben Crom reservoir’s dark waters, northwards to the steeples of rock that crown Slieve Bernagh. 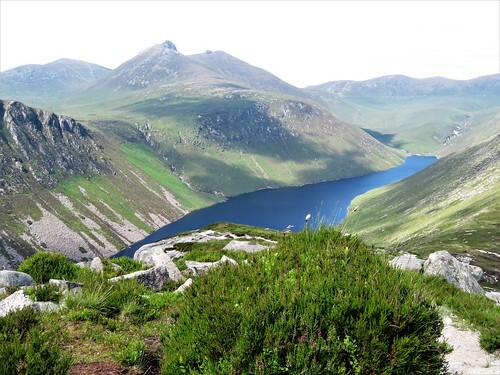 Then we followed the rubbly old drove road back down the Annalong Valley, past the shores of Blue Lough where whitecaps ruffled the water, on down to Carrick Cottage Café and a thoroughly earned pot of tea to toast St Patrick’s Day. 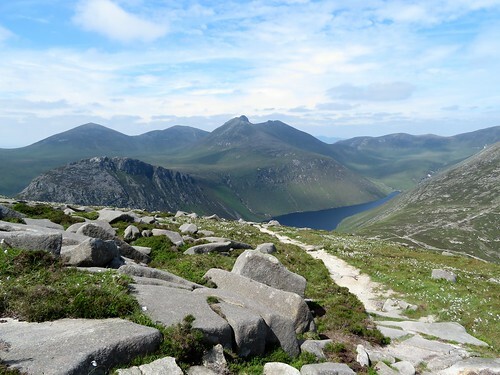 Getting there: Bus – Mournes Shuttle Service (peter.magowan@hotmail.co.uk, 07516-4712076). 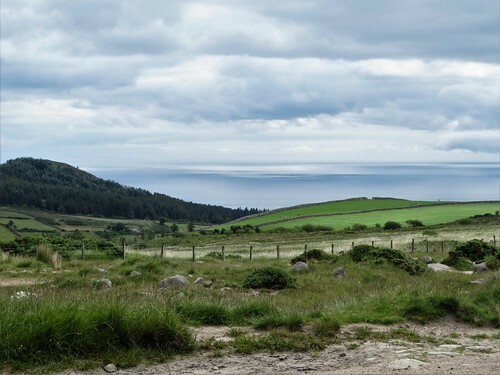 Walk (7 miles, strenuous, OSN1 1:25,000 Activity Map ‘The Mournes’): From car park, left up stony lane. 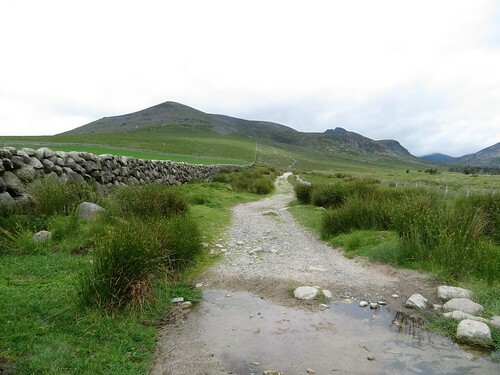 In 900m go through gate (345228); in 300m fork left and climb path with Mourne Wall on left, soon steepening. Near top, pass (but don’t cross) ladder stile on left at wall; aim a little right between two tors to reach ridge (321235) and Slieve Binnian summit. Right on ridge path past the Back Castles for ¾ mile to pass to left of North Tor (319246). Path descends, soon steeply, for ⅔ mile to path crossing on saddle between North Tor and Slievelamagan (321256). Right on rubbly path for 3¼ miles, passing Blue Lough, then along right side of Annalong Wood, back to car park. 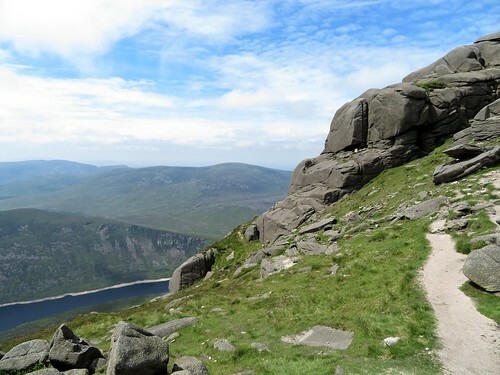 Conditions: Mountain walk – dress appropriately. 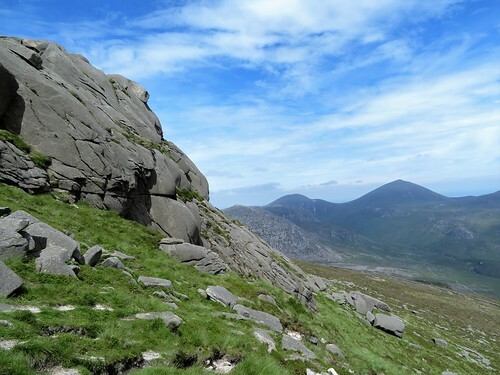 Steep, rough ascent to Slieve Binnian. Ridge path, descent and valley track are stony and slippery. Watch your step!